I have a monthly, uh, book club, if you can call it that (I’m not sure we even talked about the book last month) and right now two of our regulars are knocked up with sure to be adorable baby boys. So of course we had to do a book club themed shower, right? Right. We kept it simple. Still met at our normal book club meeting time, had planned on talking about the book, but instead had cupcakes and for gifts everyone brought books for the baby. These little boys are off to a great book collection already! Baby showers are all about Cute and Tiny. Because that’s what a baby is, right? 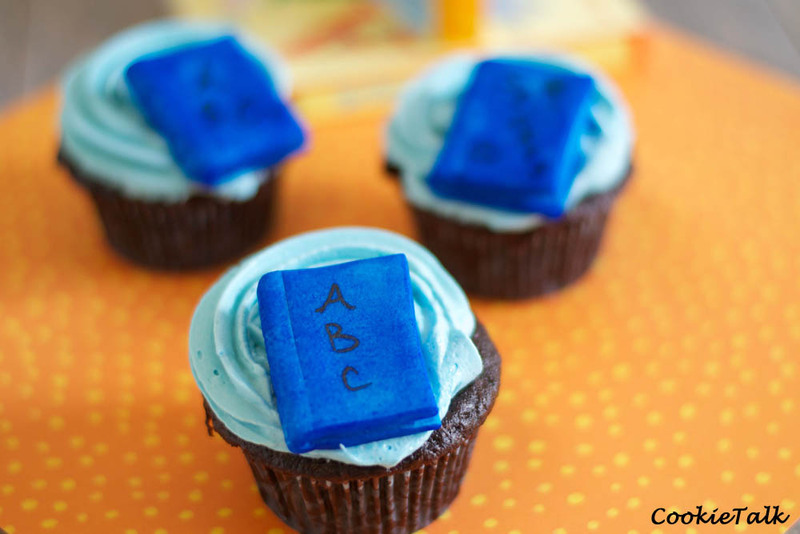 Thus, all coordinating baby shower items must be cute and tiny and I knew I had to make book toppers for the cupcakes. I must confess that these books did not turn out at all the way I wanted. I got all big headed and assumed I’d be perfect at making these because I’ve worked fondant before. Over two years ago. So yeah, I struggled a bit. But they still turned out pretty cute, all things considered. Making the books are actually pretty easy once you get the hang of it. I decided how big I wanted them to be (about 1 1/2 inches) and then doubled that and added a bit since you will be folding them over. Then for the middle I just guessed to make the pages. Just cut out a piece that fits nicely in the book. It may take a couple of tries. I used a tiny dab of water and powdered sugar to help it stick to the center. To make it more book like I used an edible marker for the “ABC” and then used a paring knife to make indentations on the side and on the “pages”. Once you get your first one done the way you like it, use it as a template to cut out the others. I just used a pizza cutter and a ruler! Let’s talk about the Don’ts I learned from this experience. 1. Do not use the Wilton Spray Food Color. Never. Ever. It’s terrible and I was cleaning up blue for the next week. And it doesn’t stick to fondant very well. It might work fine and dandy with regular icing but not fondant. I grabbed it to save time. Bad idea. 2. Do not assume that Wilton “Rolled Fondant” is all rolled and ready to go with no kneading required. It still needs kneading and rolling it out thin is still tough work. I also grabbed this to save time. Bad idea number 2. 3. Don’t expect to be perfect the first time. 1. Do experiment a few times to get the hang of it. 2. Keep your fondant covered with a damp paper towel or it will dry out and make it difficult to work with. And you will end up frustrated. 3. Knead in your food coloring. It will only take a couple of drops. You can always add more if you need to adjust your color. The spray color was simply a mess to work with! After I got started, making these were pretty easy. They would have been easier if I hadn’t done Mistakes 1 and 2. 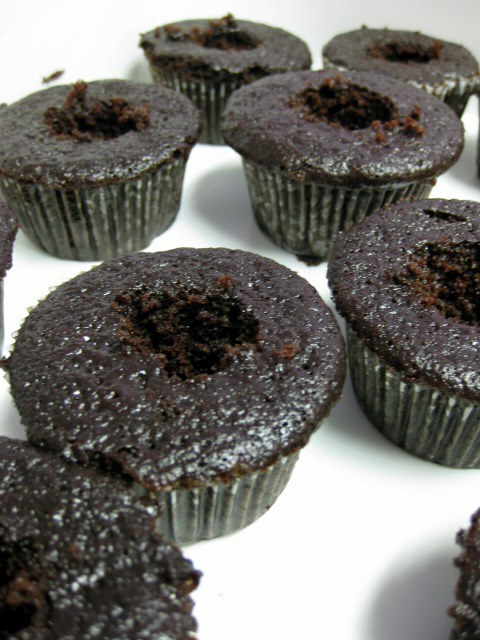 As for the cupcakes, I just used my favorite chocolate cake recipe. The buttercream was a simple buttercream. I actually don’t like simple buttercream and scrape it off my cupcake. However, I needed an icing that would hold up to warm, humid temperatures and this one does beautifully. And this cake doesn’t need a buttercream but the book needed to sit on something! 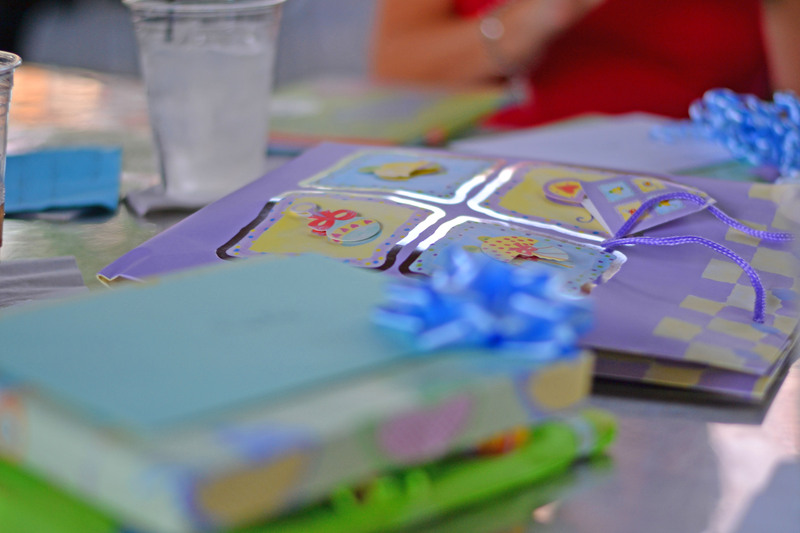 What cute baby shower ideas have you seen? Do you ever feel like you’ve lost your mojo in the kitchen? I’ve had a lot of kitchen mishaps in the last month. Early in January when I was making this I left the handle of my ladle on the edge of a still hot burner. It only melted a bit and is still usable. A few days later I was making a salted buttercream and completely over salted it. A week later, after running the oven cleaner, I put my pizza stone back in the oven only to discover it was suddenly smoking profusely, causing me to run around frantically opening all windows and turn on all fans. I felt like a fool when I discovered the cause of the smoke: a cork trivet stuck to the bottom of the pizza stone. Our house stunk for several days. 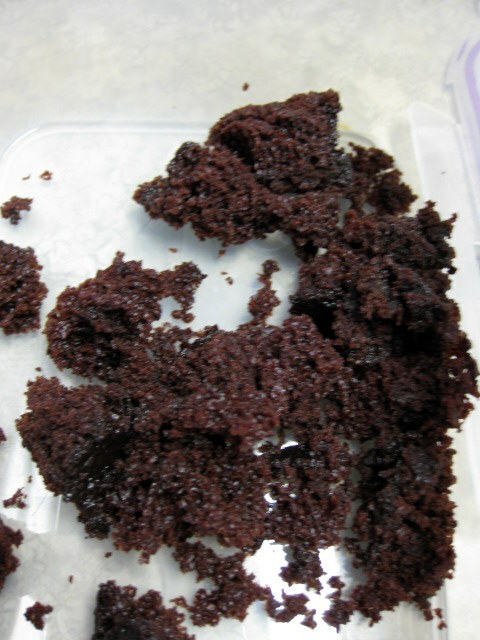 And finally, I was making Guinness brownies with a Guinness glaze (from the most recent BA) and completely ruined them by pouring the glaze on while the brownies were still hot, essentially creating pudding (but still tasty). Needless to say, my ego had been a bit bruised. I started questioning my ability to bake. 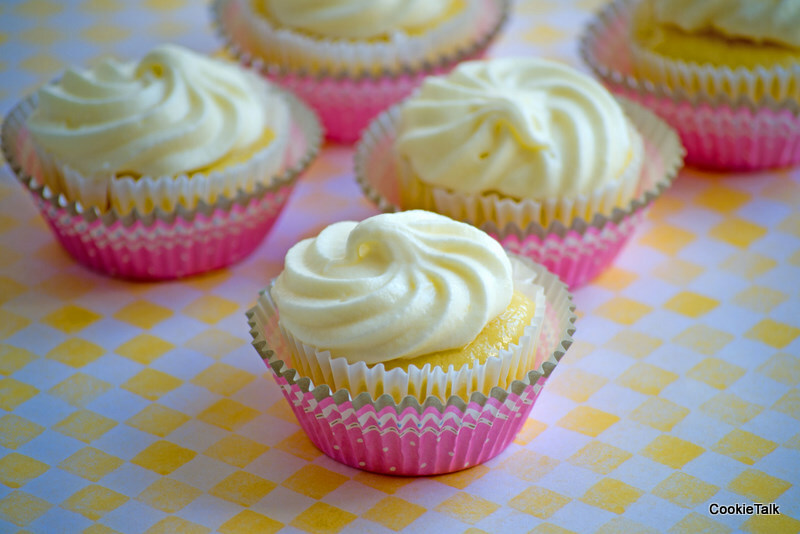 Then I saw the Limoncello and Meyer Lemon Cupcakes from Tartelette. I have always, always loved lemon desserts. I don’t make them often because they aren’t my hubby’s most favorite but after all these mishaps I needed a dessert that I knew I’d love. And they turned out beautiful and incredibly tasty. So moist and flavorful. And I didn’t screw them up or attempt to burn the house down. Mission success! Now let’s talk about limoncello. I was first introduced to this delicious digestif when we lived in Hawaii and we met our dear friends, one is Italian, the other is German. And if you didn’t know, Europeans like their digestifs. I lived in Germany for two years and came to love the digestifs brought to you after dinner. I really wish American restaurants would pick up this delightful tradition! I used to buy it all the time, but now we live in a out dated old fashioned Charming Southern State and I can’t buy it. But I can buy ever clear (makes perfect sense) and therefore I can make my own. I used this recipe from Limoncello Quest (yes, that’s right, an entire website dedicated to making your own limoncello), with two exceptions. I used less sugar, about 1/2 cup less I think, and I did not wait the full 45 days the second time around. I did the first 45 days, added the simple syrup, then waited about 10 days. And it is strong but it is delightful and will warm your soul. Even got my mom hooked on it! If you ever have digestive problems or stuffed sinuses, just have a swig of this. You’ll be better in no time! That being said, the amount of alcohol in these cupcakes is quite minor. The cake batter portion will cook out, but if you are concerned about the icing, you can easily omit it and just add extra lemon juice instead. 1. Preheat oven to 350F and position a rack in the center. 2. In the bowl of an electric mixer fitted with the paddle attachment, beat the butter, cream cheese and sugar at medium speed until light and creamy, about 2-3 minutes. Add the eggs, one at a time, beating well after each addition. Add the limoncello and beat an extra minute. 3. In a medium bowl, combine the flour, baking powder, and salt. Add flour mixture and buttermilk alternatively to the butter/eggs mixture, beginning and ending with flour mixture. Add the lemonjuice and zest. 4. Fill cupcake tins 2/3 full. Bake for 20 minutes or until a toothpick inserted near the middle comes out clean. Let cool completely. *If you cannot find Meyer Lemons, use standard lemons but add a bit more sugar. 1. In a heavy medium saucepan, stir together the lemon zest, juice and sugar and bring to a simmer over medium heat. In a small bowl, beat the egg and egg yolk to break them up. 2. Very slowly beat in all of the lemon mixture into the eggs to temper (this will prevent scrambled eggs). Scrape the mixture back into the saucepan and cook stirring constantly until it thickens up, about 5 minutes (only took 3 minutes for me). Remove the curd from the heat, let cool completely. To speed up cooling, place in refrigerator. In the bowl of an electric mixer fitted with the paddle attachment, beat the butter and cream cheese on medium speed until light and creamy, about 2-3 minutes. Add the limoncello and beat an extra minute. Reduce the speed to low and gradually add the sifted powdered sugar and beat until fully incorporated and smooth. 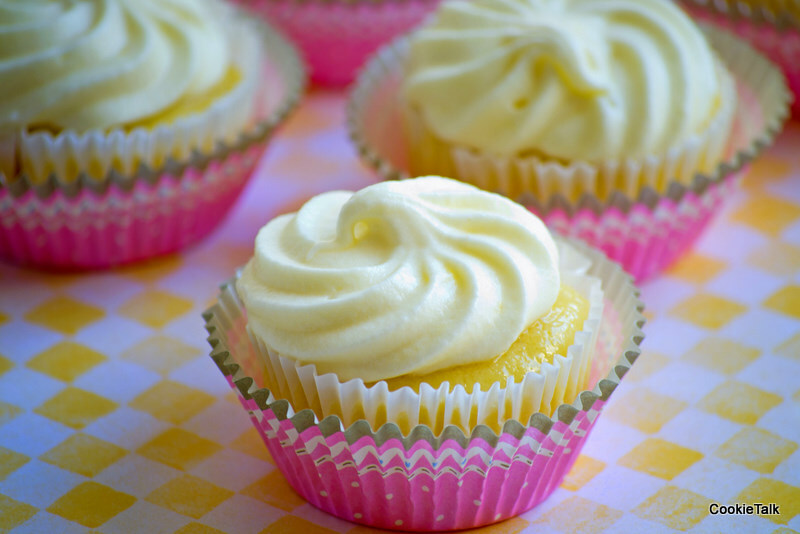 Cut a whole into each cupcake with a melon baller or the back end of a large pastry tip. Fill each cavity with the lemon curd. Fill a pastry bag fitted with a star tip with the cream cheese frosting and pipe onto each cupcake. Decorate with berries if desired. Chocolate, Caramel, and Coffee. Cupcakes, that is. Yes, this post is about all three – chocolate, coffee, and caramel. Three of my most favorite indulgences, all in one beautiful little cupcake. Last week I was requested, er, told, that I was to bring the dessert for a work pot luck. I love making a dessert that makes people smile, so I needed something good. Really good. And I’m afraid I’ve outdone myself this time. I don’t know how I will ever make anything better. I’m a serious critic of my food, and this time, I am really proud. What could I have made that tastes so good? 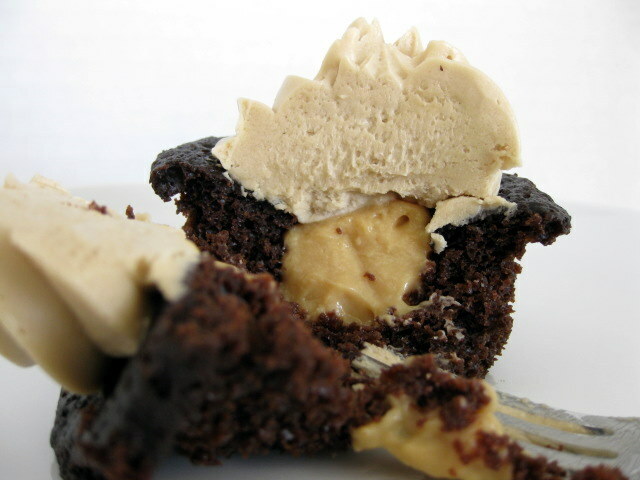 Chocolate cupcakes with caramel pudding and a coffee buttercream icing. Oh yeah. When people ate these they had a look of pure pleasure on their face. That amazing. And then, at the same time, I thought, Do I really want to share these? Maybe I should just buy cupcakes so I can keep these to myself. I got the cake recipe from Smitten Kitchen and she too writes that she didn’t want to share. In fact, she said “I kind of wanted to swat people off with a spoon.” I felt the same way! You will too. I promise. Now these cupcakes didn’t come without heartache. I knew I wanted to put caramel pudding inside, but I had never made caramel pudding before. I’ve made pastry cream many times, but never caramel flavored. The first recipe I tried came out rubbery. I was worried because it didn’t have eggs like the traditional pastry cream. I was right to be worried. It was terrible. Bleh. Try number two I used a recipe from Hungry Cravings and I was fairly certain this recipe would work since it was a traditional pastry cream recipe. But, the first time I burned my sugar. Like black in my pan. Bad. Just a pointer if you do this, fill your pot of burned, hard sugar with water and bring to a boil. It will dissolve the sugar and then your pot will be clean! Second time though, the sugar didn’t burn and I had a delicious caramel pudding. Whew. Step one was done. The pudding after chilling. Looks weird, huh? Stir first! The cake went fairly smoothly, except I overfilled the cupcakes. I knew the cake didn’t rise a lot, but I still over judged how much to fill. So I had to very carefully peel each cupcake from the pan. If I wasn’t careful, I would tear the cupcake and it wouldn’t be pretty anymore. And those “ruined” cupcakes, well, quality control is just terrible, huh? I couldn’t let them go to waste. Yummy. Finally, the buttercream. I’m not sure why buttercream gives me such a headache, but alas, it does. I learned a very important lesson when I made this buttercream. My emulsion broke. 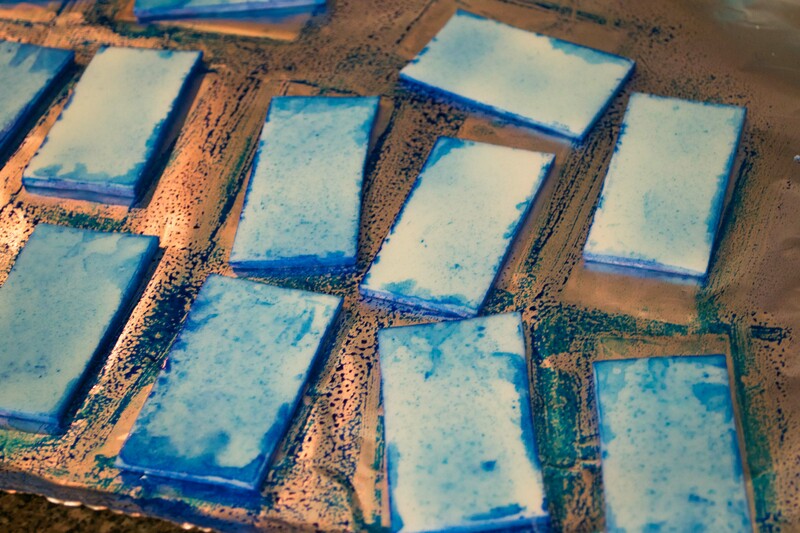 Let’s chat a bit about emulsions. According to wikipedia an emulsion “is a mixture of two or more immiscible (unblendable) liquids.” What, that doesn’t make sense? Yeah, I didn’t think so either. 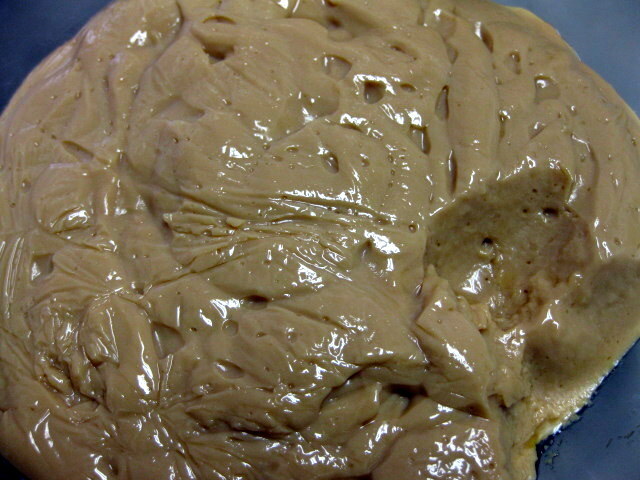 Examples of emulsions are mayonnaise and vinaigrettes. Mayo is a “permanent” emulsion. Once it is done, it’s done and it won’t separate if it’s done correctly. Vinaigrettes will have to be mixed each time since they will separate. 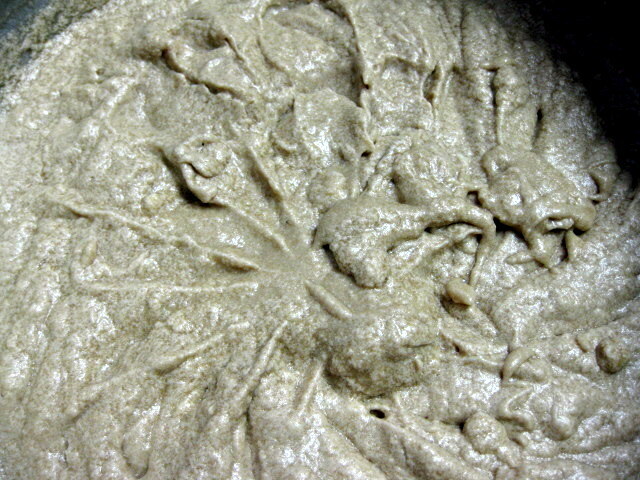 An emulsion forms when the mixture is well, mixed properly. It is broken when it’s not. And you know when it’s broken because it just looks terrible. Now, did you know that ganache and buttercreams are also emulsions? Yup, they are. This buttercream was made with egg whites, sugar, and butter. All was going well with the egg whites, but when I started adding the butter, I had a grainy, icky, horrible looking buttercream. 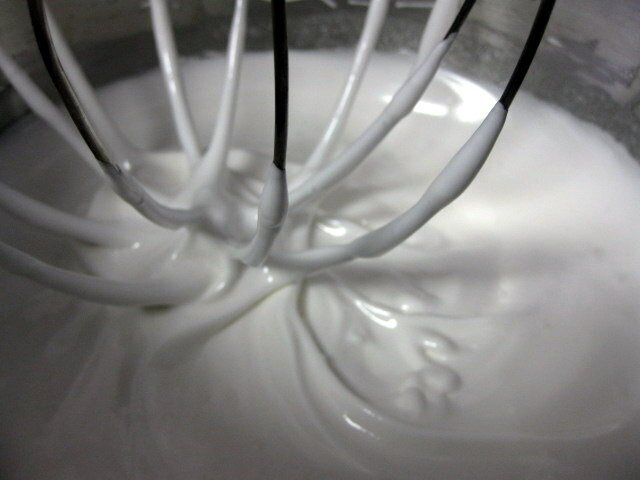 Egg whites whipped to stiff peaks. Broken buttercream. Ugly, yucky, disappointing. Drat. What to do? I didn’t want to dump it out and start over – what a waste! Thankfully, Baking 911 had pointers for fixing a broken butter cream. The site suggested if it is cold and broken, melt about 25% of the butter cream and rewhip. This didn’t work for me the first time. I tried chilling in the refrigerator and then whipping. Nothing, nada, zip. I was on the verge of a meltdown at this point. Why wasn’t it coming together? So, one more shot. I put the buttercream in the freezer for 15 minutes, then melted some again. I was so certain it wasn’t going to work that I just put the mixer on high speed, insanely fast, and what do you know – I had a smooth, silky butter cream. I did a little jump for joy! Yahoo! Then, it was time to assemble. This was the easiest part. Step 1, cut out little holes in your cupcakes. Place all your cake crumbs into a separate bowl. Save for later when you are craving this cake. This may be immediately. Next step is to fill the cupcakes. The absolute, easiest way to do this is use a piping bag. There is no reason to be scared of a piping bag here. It requires no skill whatsoever. 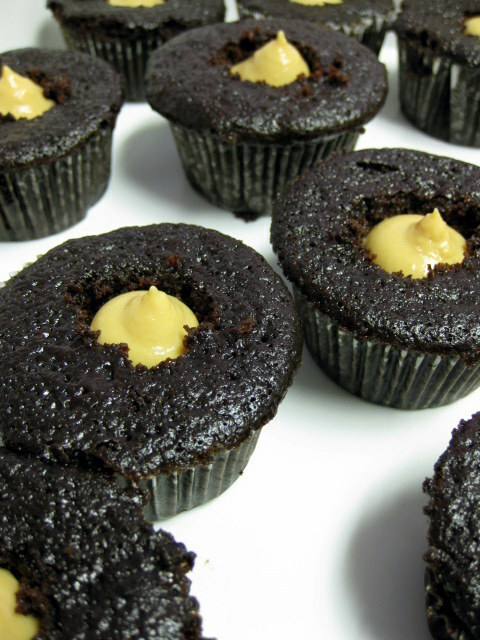 You are merely filling the cupcakes and it will make your life a whole lot easier if you use a piping bag. If you don’t have one, they are super cheap at your local craft store (particularly if you use coupons!). I prefer the 14″ Wilton Featherweight bags because they are dishwasher safe (hooray!) and just the right size. And, all you need is a simple piping tip like this one and you are set. No need for couplers here since you are using a larger tip and you are just filling cupcakes. Finally, time to top the cupcakes with that buttercream. I used a piping bag here too, but it isn’t necessary. Do whatever is easiest for you. People will love you for these. If you are willing to share, that is. And if you aren’t, don’t worry, I understand. They are that good. I only used about half of this in the cupcakes. So, either cut the recipe in half or enjoy the rest as tasty snack. Combine 5 ounces of the sugar and the water in a small, heavy saucepan. Bring to a boil, brush down the sides of the pan with water, and boil for 8 to 10 minutes, or until caramelized (this only took about 5 minutes for me. The key is to watch very carefully! Do not leave the room!) The sugar will be fragrant and a deep amber color when it is caramelized. Remove the pan from the heat and dip the bottom into an ice water bath for a second or two. Slowly stir in the milk. (The sugar may harden at this point. Just keep stirring on the heat and it will melt again). Return the pan to low heat and stir until smooth. Increase the heat to medium and heat to a simmer. Meanwhile, whisk together the cornstarch and remaining 1 ounce of sugar in a medium bowl. Whisk in the egg and yolks. Continue whisking while adding the hot caramel mixture (all of it, not just a little) in a thin stream. Transfer the mixture back to the saucepan and cook, whisking constantly, over medium heat for 2 to 3 minutes, or until it thickens and just comes to a boil. Immediately strain through a fine mesh sieve into a clean bowl and stir in the butter and vanilla. Press plastic wrap directly onto the surface and refrigerate. The recipe below is for 2 10-inch layers or about 32 cupcakes. Preheat oven to 300°F. and prepare pans or cupcake liners. Note: This is a very runny cake mixture. You will think you’ve done something wrong, but never fear, it is supposed to be like that. Divide batter between pans and bake in middle of oven until a tester inserted in center comes out clean, 1 hour to 1 hour and 10 minutes. I doubled this recipe and had just a little bit leftover. Place espresso powder in a small cup; add the boiling water, and stir to dissolve. Let cool. Bring a saucepan with about 2 inches of water to a simmer. Combine sugar and whites in a large heatproof mixer bowl set over (not in) simmering water. Whisk until whites are warm to the touch and sugar is dissolved, 2 to 3 minutes. Place bowl on mixer stand; whisk on low speed until mixture is foamy. Whisk on medium-high until stiff, glossy peaks form and mixture is completely cooled completely, about 10 minutes. Reduce speed to medium-low; add butter 2 tablespoons at a time, whisking to incorporate fully well after each addition (if buttercream appears curdled, at this point simply beat until smooth). Whisk in vanilla and espresso mixture. Switch to paddle attachment; beat on lowest speed to reduce air bubbles, 3 to 5 minutes. To store, refrigerate airtight up to 3 days, or freeze up to 1 month. Before using, bring to room temperature; beat with paddle attachment on the lowest speed until smooth and pliable, about 10 minutes.